Have you ever questioned what is the difference between Fast Startup, Hibernate, Sleep, hybrid sleep, and Shutdown? If yes, then this post will help you to clear all your doubts. Here we will be discussing the difference between Hybrid Sleep, Hibernate, Sleep, Fast Startup, and Shutdown. If we look around, we will find that terms like Sleep, hibernate, shutdown are familiar to most of the Windows users. 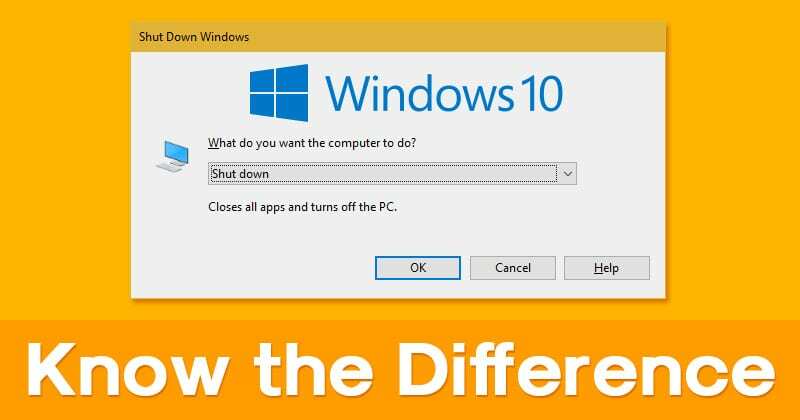 Well, if you are using the latest build of Windows 10, then you might be well aware to the fast startup. Without any doubt, all of these are different power management modes. These power management modes reduce the power consumption of your computer while you are away from the computer. So, have you ever questioned what is the difference between Fast Startup, Hibernate, Sleep, hybrid sleep, and Shutdown? If yes, then this post will help you to clear all your doubts. Here we will be discussing the difference between Hybrid Sleep, Hibernate, Sleep, Fast Startup, and Shutdown. A shutdown is a process that disconnects the power supply to the machine. The process closes all services and apps that are running in the background before initiating the shutdown process. After the shutdown, when you boot your computer next time, the system loads with its default settings and services. That’s the reason why our system tends to operate slowly after the startup. Sleep mode doesn’t disconnect the power supply, neither it disables any app or services. On Sleep Mode, the machine enters a low power mode which disconnects the power supply to the components, except the RAM. It was RAM which holds the state of the machine until that time. So, when the machine wakes up, every apps and service that are retained on the RAM gets back to their normal stage. Sleep mode is mostly used to conserve power. Hibernation is a little bit similar compared to Shutdown, but Hibernation comes with a bit of twist. In hibernation, the current state of the system is first transferred to the hard drive as a file before disconnecting the power source. So, when users power on their system, the state of the system is restored. Actually, Hibernation is a lot more effective when it comes to saving power as compared to Sleep mode, but the system takes more time to wake up. Fast Startup is a mode that arrives with Windows 10. Fast Startup is basically a combination of both hibernation and the shutdown. Just like hibernation, Fast startup saves the state of the machine on the hard drive, but it only saves the essential apps and services. The Fast Startup mode doesn’t include any non-essential apps like media players, or any third party apps. This is what makes Fast Startup more efficient compared to Hibernate. Hybrid Sleep is basically a mixture of sleep mode and hibernation. In Hybrid Sleep, the state of the machine is stored on the hard drive and then the machine enters a low power mode. One of the best things about Hybrid sleep is that if there’s a power outage when the machine is sleeping, the state of the machine can be restored as it its. So, all your pending work remains safe on the hard drive. So, these are the major difference between Hybrid Sleep, Hibernation, Shutdown, and Sleep mode. What’s your opinion on this? Share your views in the comments.